Beginning with Version 4.4, it became possible to perform several functions in NeoGroup and GroupBuilder with respect to names, folders, group images and row names by importing one or more text files. Note the above functions can all be accomplished with a single text file or with individual text files. In the interests of simplicity and clarity the examples below will use a separate text file to demonstrate each feature. Using a text file to create name lists for subjects home folders has been a long standing feature of NeoGroup, GroupBuilder and DataPost. The text file need simply contain the subject's ID (unique field) their row and their position. (It can contain more information but these are the critical fields) Importing the text file will then add the subject to the correct row and position for their home folder group page. The example above can only set names for the subjects' home folders since there is no field in the text file designating a folder. The home folder must therefore be assumed. In order to set the names for a folder other than the home folder it is therefore necessary for the text file to include a field to that effect. The text file extract above includes the same two subjects but now has an additional field indicating the folder for which the name should be set. Leaving this 'folder name' field blank indicates the name is to be added to the home folder. In the example above, subject 23432 will be in row 1 and position 1 for his home folder but row 3 and position 2 for the Football folder. Subject 45654 will be in row 1 position 2 for his home folder and row 4 position 5 for the Basketball folder. The text file can again be imported in either Names Mode or Details Mode. The following field mapping applies to Names Mode. 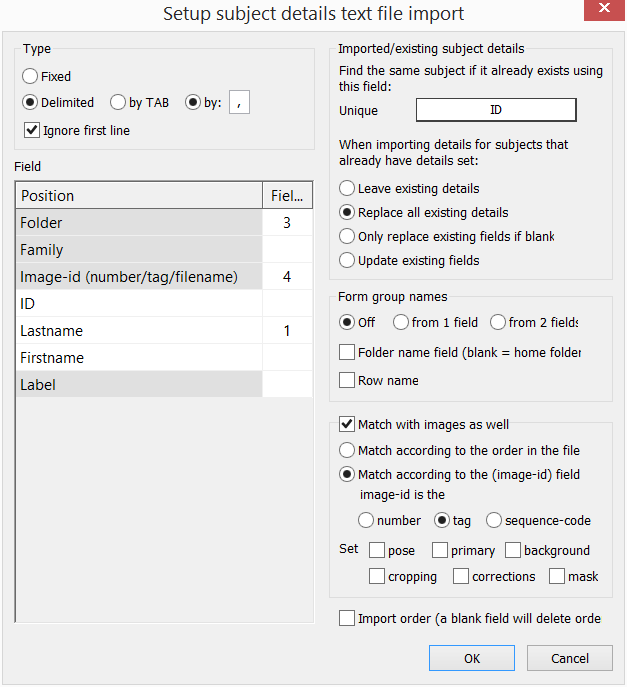 Note checking the 'Folder name field' option activates the additional field to be mapped. Traditionally row names (also referred to as headers, labels or titles) have been set manually in Names Mode. When name lists have been created by text file the row names would default to Row 1, Row 2 etc. With the advent of Version 4.4 it is possible to also set row names by text file. Importing the text file and mapping the fields can again be done in either Names Mode or Details Mode. Using a text file to import subject data and create their home folders is a long standing practise in Timestone Software and is well documented elsewhere. However with Version 4.4 it became possible to create non home or 'extra' folders. In addition it became possible to import group images and allocate them to their correct folder. These two new features are demonstrated by the single text file below. Note however each function could be performed by its own separate text file. Conversley this text file could be used in conjunction with any of the features listed above. Importing the text file with the mapping shown in the screen grab will have the following result. Note this text file can only be imported in the Details Mode of NeoGroup or GroupBuilder.